Eco Vita Creams are all natural, organic face creams made by hand in small batches by Yellow Birch Farm of Deer Isle, Maine. EcoVita skin cream (previously "About Face") was born on Deer Isle, Maine, on our MOFGA certified organic farm. Here, with our family, dedicated interns, a herd of Alpine goats, chickens, pigs, and acres of vegetables, we are committed to growing and providing the highest quality organic food for ourselves, our community and its visitors. We know that ”We are what we eat!” We work in the sun, rain, snow, wind, and salty spruce air, and recognize that we need to feed our skin too, our body’s largest organ. After many trials we developed a skin cream that we feel mirrors our values, imbuing our skin with deeply penetrating nourishment. 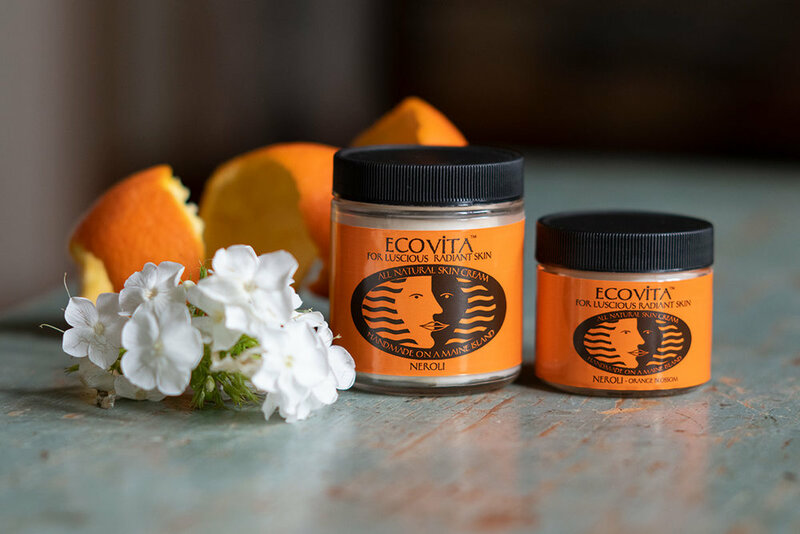 EcoVita is made with the highest quality organic, approved for organic use & sustainably sourced ingredients, to bring to all ages & skin types, from farmers, fishermen, & families, to sailors, skiers, & CEO’s, an intensely moisturizing cream which protects and delivers a revitalizing healthy glow for luscious radiant skin. WHICH CREAM IS RIGHT FOR MY SKIN? Neroli*: Floral, citrusy, sweet, and exotic, it is gentle to the skin and soothing to the psyche. It tones and tightens the skin, promotes cell regeneration and elasticity, is rich in anti- oxidants, nourishing, rejuvenating, regenerating, Neroli is beneficial for all skin types, especially good for mature and environmentally damaged skin, . Rose*: Palma Rosa imparts a rosy fragrance which relieves stress and anxiety. It promotes growth of new skin cells, restores skin health, and is useful for both dry and oily skin. Clary Sage*: Sweet, herbaceous, and up lifting. It is antiseptic and anti-inflammatory, is known for balancing the production of skin oils, can strengthen, tone, and tighten the skin and has strong anti-aging properties. Unscented*: for those who are sensitive to scents or who prefer the natural smells of the beeswax and cocoa butter. Ecovita creams have all been stability and challenge tested to ensure quality and shelf life. organic sesame oil* - being rich in vitamins A,E, and zinc, this oil helps improve the elasticity of the skin, repairs damaged skin cells and promotes the production of collagen. As well, it aids in the treatment of acne, psoriasis, wounds, burns and other skin infections. With a low natural SPF, sesame oil also helps protect your skin from dangerous ultra-violet rays. organic coconut oil* - rich in proteins for cellular health and tissue repair, it is comprised of three medium chain fatty acids with antimicrobial properties and the ability to keep skin smooth and retain moisture content of the skin. organic cocoa butter* - has a high concentration of antioxidant compounds which help neutralize free radicals, reduce inflammation, protect skin from environmental stresses, and boosts overall skin health. organic beeswax* - full of vitamin A for cell turnover and reconstruction, excellent for moisturizing and softening the skin, antibacterial, anti-inflammatory, protective barrier that does not clog the pores. organic glycerine* - helps maintain the skin’s water balance. borax*- a natural element used as an emulsifier. vit.E**- a nutrient and antioxidant, boosts collagen production and supports new skin cell growth. 1,3 Propanediol**- boosts preservative efficacy, improves skin moisturization. tetrasodium glutimate diacetate**- chelating agent and preservative booster. xanthan gum**- used as a stabilizer to keep products from separating. lactic acid**- used a very low percentges it is pH regulating, antimicrobial, and helps retain moisture.